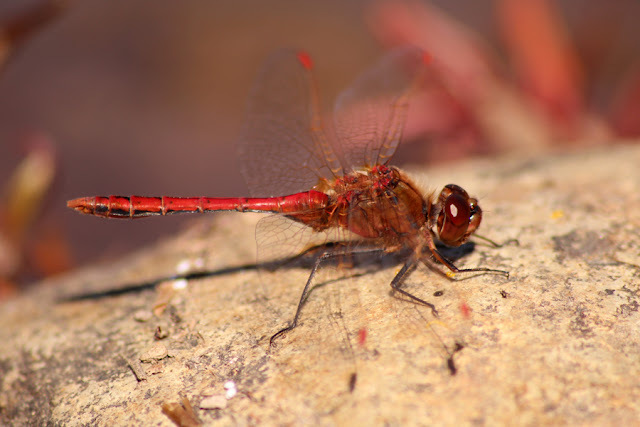 If you happen to follow the Tweeters mailing list - that is not some social media site, it's the Washington birding listserv - you would know that coastal Washington has been absolutely on fire with rarities. 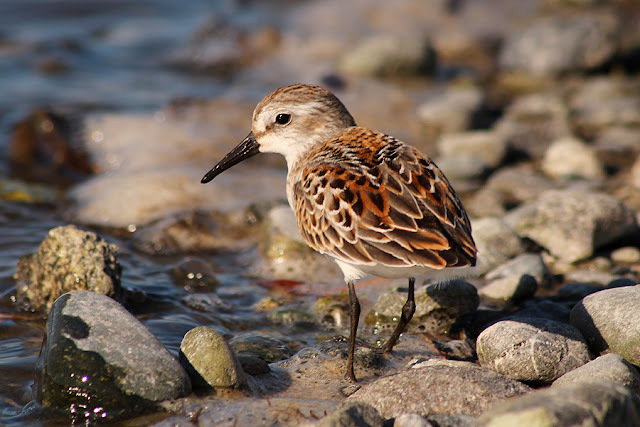 In the last week alone, reports of Elegant Terns have been dotting the coastline, a Smith's Longspur and Buff-breasted Sandpiper have been seen near Ocean Shores, a Hudsonian Godwit turned up at Bottle Beach, a Great-tailed Grackle has caused a stir in Puyallup, a Long-billed Murrelet was reported from Edmonds, and pelagic birding has produced a Great Shearwater. While writing this, I just found out a Lesser Sand-Plover was found at Ocean Shores today, too. The bottom line is: there is no way all those rarities have skipped by us and we have no usual birds around. Jeremy K. and I decided we needed to at least try to remedy the situation by heading out to Whiffin Spit first thing in the morning to check on the shorebirds and then continue on to Jordan River to beat the bushes for migrants. As I told Jeremy K., the J&J style is to swing for the fences and fall short... but at least we try! In the end, we had a great day with a few nice birds along the way, but nothing earth-shattering like the cluster of megas south of us. At Whiffin, we got the ball rolling with a long-staying female Bufflehead. 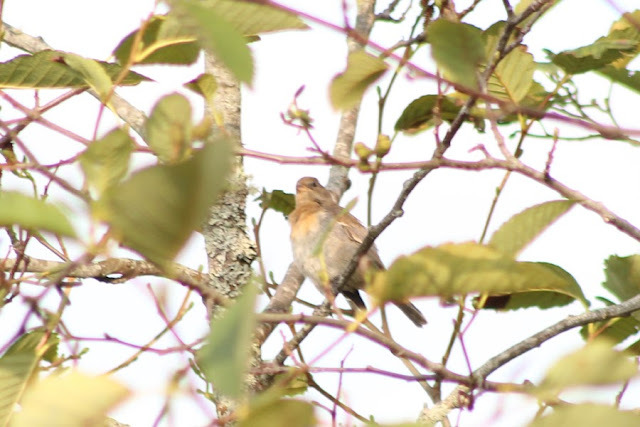 I know that sounds rather blasé, but it is a surprisingly good bird in September! Jeremy K. scanned along the shore and spied a flock of peeps out near the breakwater. They had flown by the time we got out there, but we relocated them in the usual stretch that shorebirds seem to favour. While scanning through the flock of ten or so Western Sandpipers, I passed over a Black Turnstone. As is often the case, there wasn't just one turnstone but rather a small, well-camouflaged flock. 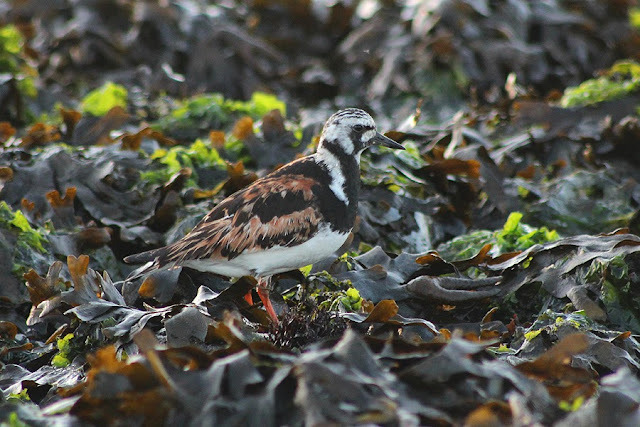 A Ruddy Turnstone had been reported over the past few days, so I surveyed the scene and promptly found the much rarer and sharper-patterned Ruddy partially obscured by a rock. It eventually started to walk around and I managed to get a decent record shot of the occasion. After Whiffin, we booked it out to Jordan River to try to catch the tail-end of heightened passerine activity. During the drive, Jeremy K. had one of his highlights of the day when a Black Bear darted across the road. At Jordan River, we almost immediately locked on to a nice flock of passerines and possibly muttered something about "birds dripping from the trees". It was dizzying trying to keep up with each new source of movement. We quickly tallied Cassin's and Warbling Vireos, Yellow and Orange-crowned Warblers, some juvenile White-crowned Sparrows, and then a different bird came flying in. We raised our binoculars and were surprised to see a Lazuli Bunting. I wouldn't want to put any money on it, but it may have been a fall female. At any rate, I did take a rather lousy record shot. Amazingly, Rocky Point Bird Observatory banded one the day before, as well. We couldn't dig out anything else of interest, but the birding was consistent. We had a good number of migrants to pore over and we hooked into some interesting mixed flocks. We walked down the gravel road just around the corner of the "town" and, with some pishing and pygmy-owl tooting, we managed to draw out: 1 Western Tanager, 1 Black-headed Grosbeak, 1 Hutton's Vireos, 6 Yellow Warblers, 2 Wilson's Warblers, 1 Orange-crowned Warbler, 1 MacGillivray's Warbler, 1 Pacific-slope Flycatcher, 2 Golden-crowned Kinglets, and 12 Chestnut-backed Chickadees. My personal favourite event, however, was birding along the bird-themed roads (Petrel, Cormorant, and Murrelet) just west of Jordan River. These roads were set to be developed years ago, but an economic downturn put it on hold. Areas that were cleared to showcase the lots have since filled in with alders and I always suspected these young deciduous swaths would be good during migration. We initially had minimal luck, but we finally found some activity as a Pacific-slope Flycatcher darted out and back in to the dense alders. We noticed more movement further along the road, so we walked to check it out. We managed to find around a dozen flycatchers hawking insects through the alders, with Pacific-slope, Hammond's, and Willow all taking advantage of the insect-rich smorgasbord. Additionally, we found a Warbling Vireo, ten or so Yellow Warblers, a couple Orange-crowned Warblers, and single Wilson's and MacGillivray's Warblers. If there was a good drizzle that put the birds down, I could see this area being extremely productive! We spent the entire morning at Jordan River and ended up with 72 species, which was better than we expected. We headed back east to Muir Creek and found the activity to be rather underwhelming. The highlight for me was a couple of male Saffron-winged Meadowhawks, including one that eventually posed for some photos. We worked our way through to Metchosin via Lindholm Rd., stopping to check a couple reservoirs along the way and coming up empty on birds worthy of mention. At Albert Head Lagoon, we were surprised to see a flurry of gull activity straight out from the parking area. We set up scopes and could only see Heermann's, California, and Glaucous-winged Gulls and unfortunately no signs of our hoped-for terns. We checked the lagoon for shorebirds and that was also pretty lackluster with only a couple Greater Yellowlegs and lone Killdeer in attendance. We sifted through the ducks at the far side of the lagoon and were surprised to find a couple of early American Wigeons. We sat on the logs and put in another attempt find something interesting like a jaeger among the gulls. I did eventually find a nice bird - the closest gull was actually an adult Ring-billed Gull! We were looking way out into the heat haze and the best bird was right in front of us! 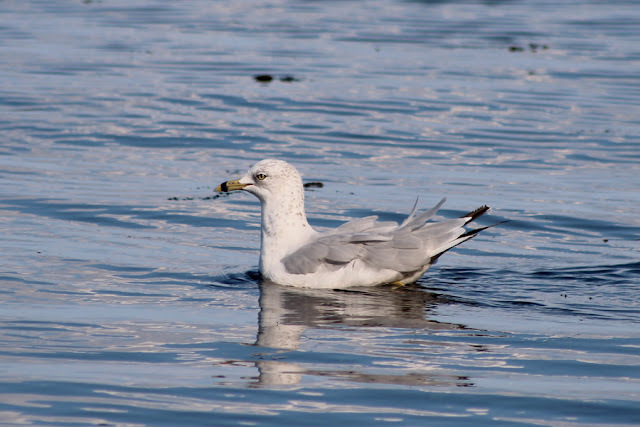 That gull with the black ring on its bill... yeah, that's a Ring-billed Gull conveniently enough! We finished the day off at Esquimalt Lagoon. We had more peeps than I expected, but no Semipalmated Sandpipers in the mix. We did get our first Least Sandpipers of the day and I snapped off a few shots of a very cooperative Western Sandpiper. Our last day bird was a lone Caspian Tern on the gravel bar near the bridge, which put us up to 93 species for the day. We were not target birding to fill in our gaps, so we could have easily cracked 100 if we tried to fill in our easy misses and also hit up the Victoria waterfront for increased shorebird variety. I'll close this off with one of the shots of the Western Sandpiper from Esquimalt Lagoon.